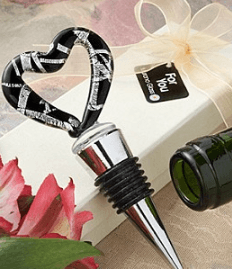 Add a heart warming memento for your guests to treasure with these Murano Glass Collection heart design wine bottle stopper favors. Inspired by the beautiful works of the famous-for-centuries glass artisans of Murano, Italy, our exclusive Murano Glass Collection favors are exceptional tributes to the Italian treasures. 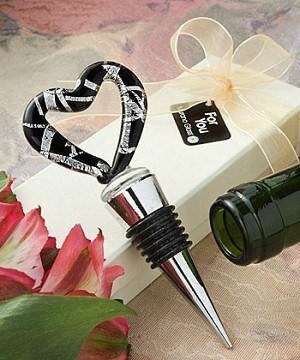 Sure to make your guests hearts swell, each heart design wine bottle stopper measures 4 ¾” x 1 8/9” and has a shiny finish silver metal conical base, wrapped with a black rubber gasket for a tight seal, topped with a stunning glass charm in the shape of an open stylized heart, in a lush black with a metallic silver line pattern design. Then you can pick Birthday, anniversary, wedding or thank you card. The package is also suitable for postage.